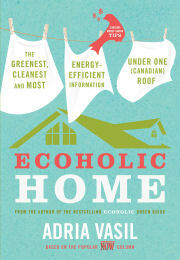 Adria Vasil is the acclaimed and bestselling author of Ecoholic: Your Guide to the Most Environmentally Friendly Information, Products and Services in Canada. She has appeared on television, radio and in print numerous times and has become a pundit for green living. Vasil lives in Toronto. Our resident Ecoholic comes to the rescue again, offering reminders and tips on how to keep your castle (however humble) clean, energy-efficient and healthy. We spend so much time at home — why not make it a sustainable haven instead of a polluting, off-gassing cesspool? Ecoholic Home addresses the green side of the economic crisis, and includes a resource guide for finding designers and contractors, and for renovating and shopping green.